Please note that ETHOS no longer endorses visits to Bac Ha Market. This is simply because we don't believe that Bac Ha is the the best of what the region has to offer. ETHOS have trialed our own tours on a number of occasions in many different ways and have not yet made it work in a way we are fully satisfied with. The biggest factor for us is travel times and location in relation to Sapa. The market itself is something most people can explore fully in an hour or two. Whilst it provides some excellent photo opportunities, the market is not a full day trip. In addition, we are concerned that many visitors choose to use their camera in a way that is sensitive to the peoples and cultures. ETHOS realise that the market might seem attractive, primarily due to good marketing by the Hanoi agencies and guidebooks. Please be aware that most of those selling the trip in Hanoi have never actually visited the market. Our STRONG RECOMMENDATION is to avoid seeing Bac Ha as a day trip starting in Sapa. These tourist group packages simply aren't worth the hassle. Not only will you spend up to 6 hours in a crowded minibus, but you will also arrive too late to see Bac Ha Market in all its glory. Whatever you hear from the tour companies in Hanoi to the contrary, Bac Ha is not a one day trip from Sapa. We feel there are other, more genuine experiences that we passionately believe are better for visitors and for local people. Every experience we provide strongly reflects what we believe constitutes a balanced cultural exchange. When it comes to one day tour Bac Ha, we are afraid it's hard to do it in a truly responsible way since the market is pretty much aimed towards catering for mass tourism. Bac Ha Market is one of the biggest and most well know in all of North Vietnam. The energy and colour of the Flower Hmong People give the area a unique vibrancy. Bac Ha Town is a three hour drive from Sapa and the market occurs every Sunday. The best way to see the market in all its glory is to arrive early and leave before the crowds of tourists arrive on the buses between 10am and 11am. This either means a 5am start from Sapa, or an overnight stay in Bac Ha on Saturday night. By doing so, not only will you avoid the tourists, but you will also see the market in full swing. Many different ethnic groups such as Flower Hmong, Phu La, Black Dao, Tay and Nung minorities gather to buy and sell local products that cannot be found elsewhere. This makes the market a portrait photographers dream. Indeed most locals paid little attention to you, rather choosing to focus on their business and the short Sunday-sized window of opportunity. One possible way to avoid the crowds and unnecessary car travel is to arrange for collection in Lao Cai on Sunday morning and head straight to Bac Ha market. 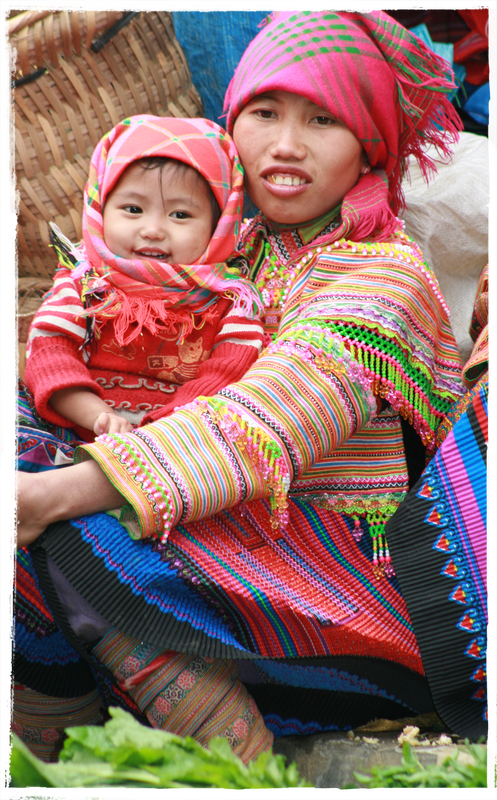 Should you wish to do so, ETHOS can offer private tours that use our own trained Black Hmong ethnic minority guides. We can arrange for private transportation to meet you in Lao Cai, head straight to Bac Ha to beat the "rush" and then bring you to your chosen accommodation in Sapa on Sunday evening. On this basis, it would be advisable to arrive in Lao Cai on the earliest possible train from Hanoi. ETHOS differ in the fact that we visit a beautiful flower Hmong village after our market visit and this area sees a very low footfall of visitors. Alternatively, groups tours originate in Sapa and depart at 7.30am. The buses arrive in Lao Cai ready for passengers from the trains at around 8.30am. There is normally a short wait in Lao Cai while people take some breakfast and join up with their groups before heading off to Bac Ha for around 10.30am. Expect the minibuses to be crowded. We have no control over the quality of both the drivers and of the guides who are predominantly Vietnamese who come up from the lowlands seeking work. We are strong advocates of using skilled local guides and therefore do not provide such group tours. If this is something you are looking for, there are many other tour companies that provide such trips. Both Coc Ly and Can Cau Markets are a similar distance from Sapa. Whilst each is beautiful, ETHOS feel that neither market is a viable day trip from Sapa due to the distances involved and the road access to each location. A private tour departing from Lao Cai is $80 per person based on a group of 2 persons. For larger groups, please contact us.